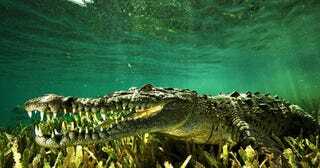 Is A Rise In Crocodile Hybrids Endangering The Cuban Crocodile? The Cuban Crocodile is a critically endangered species. What's threatening it? A history of hunting, habitat destruction, and, increasingly, the rise of a new group of crocodile hybrids, resulting from interbreeding with another crocodile species. The full story is after the jump.